George and Jeannie Chapman and their children were an Amerindian family who, in September 1941, lived in Ruby Creek, British Columbia. They lived close to the railway, upon which Mr. Chapman worked. 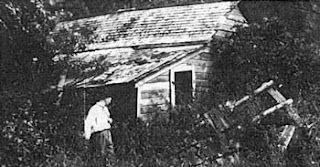 Mid-afternoon, one September day, the oldest Chapman child (who was 9) came running into the house stating there was a cow coming down out of the woods. He was agitated enough for his mother to decide to take a look at what could have upset him. It continued to approach and, whilst she stood her ground, she ordered her oldest child to round up his siblings and get a blanket. Believing the creature may be after the children, she decided to use a blanket to shield them. When the creature was about 100ft from her, she held the blanket aloft and backed away with her children out of sight behind her down the river nearby and then they fled towards the village. She hoped by concealing the children in this way, the creature may not pursue them but instead busy itself by searching the house for them. Her instincts proved correct as it did search the house and then an outhouse where it broke apart a very large saltfish barrel allowing them to make their escape. Mr. Chapman meanwhile returned home from work. He found the outhouse door broken, and very large footprints milling around the property. Concerned, and with the stories he knew of "sasquatch" he searched the property for his family. He found their tracks by the river and saw no large footprints following them but his relief was tempered when he then stumbled upon more large footprints disappearing back into the bushes near the railway. Over the following week fresh footprints were found around the house each morning, the dogs were heard to become very over excited at night and the couple heard unnerving noises outside. Being sensible folk, they decided to leave their house and did not return. Later investigation details can be found here and a little video with some more details on those is below.